JB Pritzker's gubernatorial win and retention of mostly Democrats in the Illinois General Assembly, as well as the 2018 victory of Democrats in the U.S. House of Representatives, is a signal to all the liberal think-tanks to come out of hiding and start reporting on the devastation left in the wake of the Rauner administration. First, according to USA Today in a story posted way back in November of 2018, Illinois notoriously took three of the top 15 rankings for the worst cities for black Americans, Springfield ranking 11th. I only noticed it because it was featured in an article by sj-r.com about the Springfield Mayoral race between incumbent Jim Langfelder and challenger Frank Edwards discussing the problems of race and economic inequality. 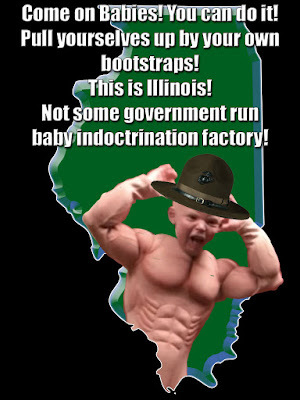 This evening as I was preparing a diatribe on the subject I stumbled upon yet another scathing criticism of Illinois, this time, about babies. News channel 20 (WICS/WRSP) revealed that the report came from a non-profit called ZERO to THREE. Here is the link to the Illinois page on that site. Before you click, take a deep breath because there is lots of data. Hillary Clinton said "it takes a village." Everyone scoffed. She lost. Mother is supposed to be home to nurture the children 24-7. Dear old Dad comes home at the end of a hard day's work and dolls out allowances and pays the bills.Then Mother gets on her knees and then bends over and such, right? Isn't that why our laws are written the way they have been since the birth of the nation? Life isn't supposed to be more complicated than that! If it is, it because of what, sinners? I thought you were pro-life? Life doesn't just end at birth, fellas. Dealing with race in Springfield? When I was in history class at Grant Middle School, I cringed when I learned about slavery because I wondered how my black classmates felt hearing about it. It must have filled them with immense hatred and fear. Craigslist has a serial "Flagger"
No advertising is now or ever will be solicited for this blog, its owner or affiliates. This blog, its owner and affiliates are not financially supported by Google Ad Sense, any sponsors, subscribers, political action groups or activist organizations. Any commodity, product or service appearing in posts or links on this blog was selected exclusively on its own merit.